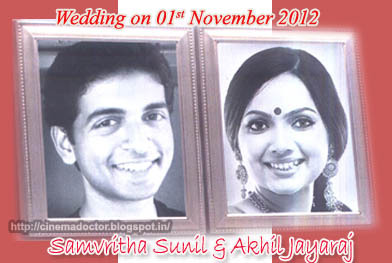 Samvritha sunil, the top heroine from Malayalam film industry is getting married on the 1st of november this year. California based engineer Akhil is the groom. Their engagement was held last month and Samvritha made the public announcement about her wedding during Asianet film awards ceremony held at Dubai. The marriage is expected to be held at Vasava guest house in Kannur. Samvritha Sunil made her debut in films with Rasikan in 2004. Since then she has acted in a variety of roles, making her one of the top heroines in Malayalam film industry.